Unreal Lawns supply and install artificial grass in Shaw and the north west of England. We serve domestic and commercial customers in the area, with products suitable for a wide range of applications from outdoor spaces and gardens, to event areas, exhibition space and more. See below for some examples of projects we've carried out in the Shaw area. We are happy to announce that another job has been completed, on a new build Wiggetts house in Shaw, Oldham. We don't do too many front gardens but this is a beauty as you will agree. The grass used here was Luxury 35mm. We love being able to transform gardens and we think our installation team have done an amazing job once again. The lush green lawn leading to the house has transformed this area in to a smart, sophisticated introduction to the property. The front lawn is the first impression people get of your property and your lifestyle, so smart and sophisticated doesn’t sound too bad to us! The tenants will never need to worry again about arriving back from a holiday to be greeted by an unruly wilting front lawn. Instead, the house now looks inviting and well-maintained. And who would know this wasn’t real grass?! Although your neighbours might have their suspicions when you haven’t had the lawnmower out in months and your lawn still looks better than theirs. Why waste your time maintaining your current lawn when there are so many better things you could be doing. Unreal Lawns could save you a lot of time and hassle, plus freeing up some storage space where you hide the lawn mower away. You are also likely to save money in the long run: not having to spend money on weed killer, watering hoses/sprinklers, lawnmowers etc. 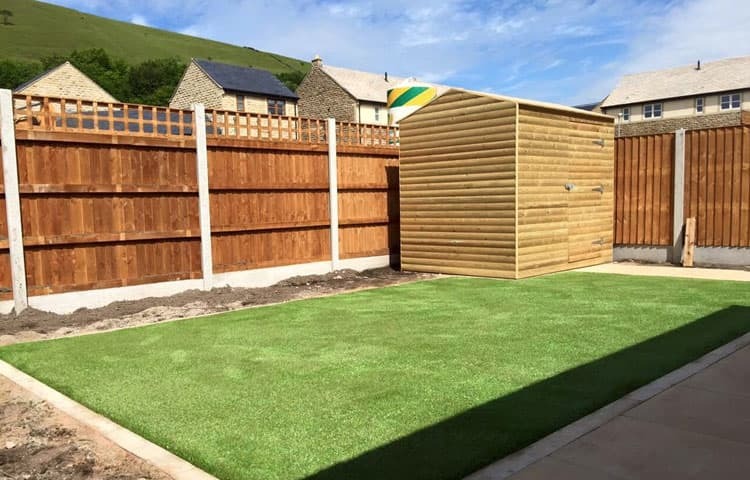 The best part is that there is no hassle involved for you; our friendly team of experts will install your artificial lawn so you can relax and have a cup of tea while we transform your garden.